Àite Cruinnichidh i Fort William, Skottland: Bestill nå! We require a 50% non refundable deposit for an advanced group booking. This will be taken from your credit card by us once you have made the booking. The rest may be charged 4 weeks prior to arrival or on arrival. We consider a group 5 or more. In the event of a no show, you will be charged the full amount. Please ring to enquire about availability as we do not allocate all the rooms on this site, we may be able to take your booking as we can sleep 30 people. At times we do offer discounts for groups taking the whole hostel. 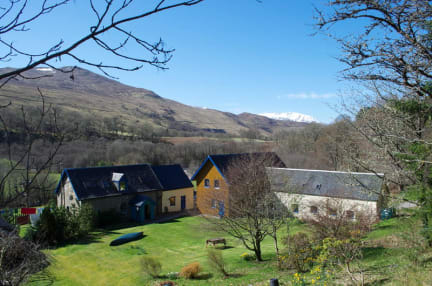 Àite Cruinnichidh is a warm, comfortable, friendly country hostel in converted barn, set in stunning mountainous surroundings 15 miles north east of Fort William and 2 miles from Roy Bridge. As we live on site, this is also a very safe hostel to stay at. 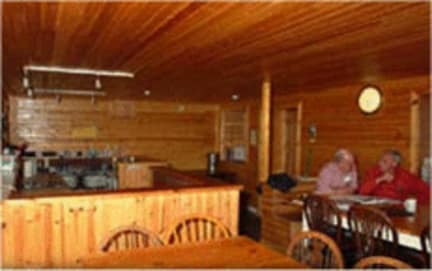 It is an ideal location for walking, climbing, canoeing and mountain biking. There are 7 rivers for paddling within 20 miles of Àite Cruinnichidh. Extensive cycle routes are also nearby. We can advise you on walking and cycle routes with maps available. Additional features include SAUNA, en-suite family/double room, seminar/conference room and reading/quiet room. All bedding is included. We also have an excellent self catering kitchen and drying room for all your wet clothes, tents etc. Most of our rooms sleep 4 people, but we do have one six person room and one twin. There is also a standard double and a double/family room en-suite, this room has two additional bunks but only suitable for children at an additional cost. Our rooms are ideal for families. Please note that not all our rooms that are available will be live on this site all the time. We have a large garden for outdoor games or just to relax in. We can also offer a 45sq meter fully equipped meeting/seminar room for course work, slide shows or ceilidhs. There are several buses and trains from Fort William to Roy Bridge and we will pick folk up from the train or bus in Roy Bridge when we can and if notified by phone call prior to arrival. This service is not offered to large groups. PLEASE NOTE, WE WILL NOT BE OFFERING THIS SERVICE FROM THE 23RD DECEMBER TO 3RD JANUARY. If travelling from Glasgow it is possible to get off at Roy Bridge, before Fort William. We can lock up your gear if required. Outdoor activities such as Quad biking, canoeing, rafting, paint ball etc can be organised locally. Unfortunately we cannot organise the weather! PLEASE REMEMBER TO BRING FOOD WITH YOU AS THE NEAREST SHOP IS FIVE MILES AWAY. We do not have a shop at the hostel. If you are a group please look at the group booking conditions. We consider a group of five or more.